Higher Gills Farm nestles at the foot of Pendle Hill in the heart of Lancashire and is owned and farmed by three generations of the Pilkington Family. The farm is a mix of pasture land,woodland and moorland with panoramic views over the Forest of Bowland and the Ribble Valley. 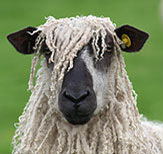 All our products are traditionally crafted from the wool of our pedigree Teeswater flock. Darrell and Freda have kept a small flock of pedigree Teeswater sheep for 30 years and prior to 2001 used Teeswater rams on a flock of 400 Dalesbred ewes producing Masham lambs. The Masham females were sold on in the autumn as flock replacements on lowland farms. All our products are designed by Freda Pilkington here on the farm and either crafted by herself or woven at a mill practising traditional production methods. 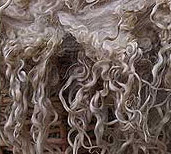 This is extremely important to us as it ensures the fine quality of the wool is retained. We hope you will agree and find our quality products give you pleasure and service for years. 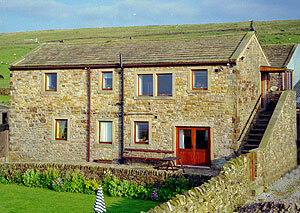 Higher Gills Farm Self Catering Holiday Apartments. If you want a complete escape from the stress and strain of modern life, a stay at Higher Gills Farm could be just what you need. Situated at the foot of Pendle Hill, Higher Gills Farm offers magnificent panoramic views of the Forest of Bowland, and the Ribble Valley. In the distance can be seen the high moors of the Yorkshire Dales including Ingleborough and Penyghent. Also you can see across to Malham Moor and Malham Cove and the Aire Valley, and then over into Wharfedale. 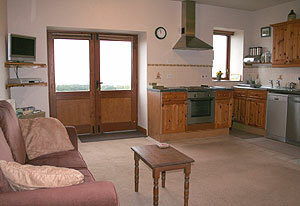 We have converted a 200-year-old stable into two self catering holiday apartments. Each apartment sleep 4 with each having one double bedroom and one twin bedroom, open plan kitchen lounge and bathroom. There is ample private car parking, a large lawn and patio area with barbecue facilities.